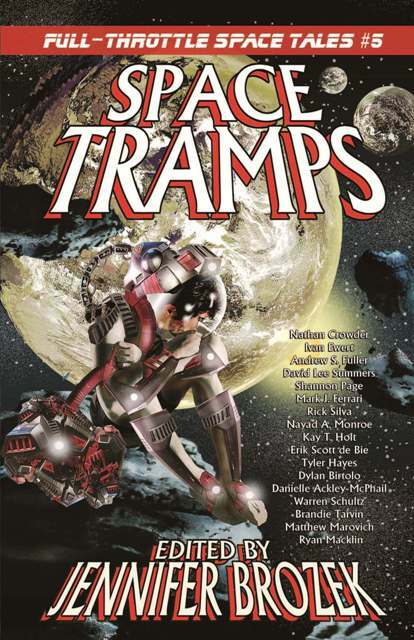 An anthology I’m in recently hit the virtual (and I assume not-so-virtual) shelves: Space Tramps, the fifth in the Full-Throttle Space Tales series, published by Flying Pen Press. It’s an anthology edited by the virtuoso that is Jennifer Brozek, and it’s got a hell of a line-up. I’m personally excited to read the other stories in there, but this blog being my main vector for shameless promotion, I’ll tell you about mine. You know how in science fiction, people tend to get the best of many worlds? Great technology, cheap fuels, long lives, things like that? The stories in Space Tramps are about Not That. They’re about people who had to pay so that others would have that, or people who weren’t lucky enough to be born on the right system, or people who had a run of bad luck, or people who served in wars that were not glamorous or noble. These are stories about the hobos of sci-fi’s first worlds, and (particularly in my case) about downtrodden people in sci-fi’s third worlds. I suppose I should point out that you can still get the other anthology recently published that has one of my stories in it, Human Tales. If you like short fiction, and you like the idea that I should have sweet sweet monies to go into my “designing games that aren’t Hit a Dude” coffers, I recommend checking those out. Sweet! I look forward to buying a copy when it’s available on the Kindle.